The “Spotlight” cast with the reporters they play in the movie. In 2003, the members of The Boston Globe Spotlight Team won a Pulitzer Prize for a series of reports that uncovered the systemic cover-up of child abuse by the Catholic Church in Boston. The story of how they conducted their investigation is told in the movie “Spotlight,” which opens in Boston on November 6. Below, learn about the real-life Boston Globe reporters featured in the film, and the actors and actresses who portray them. 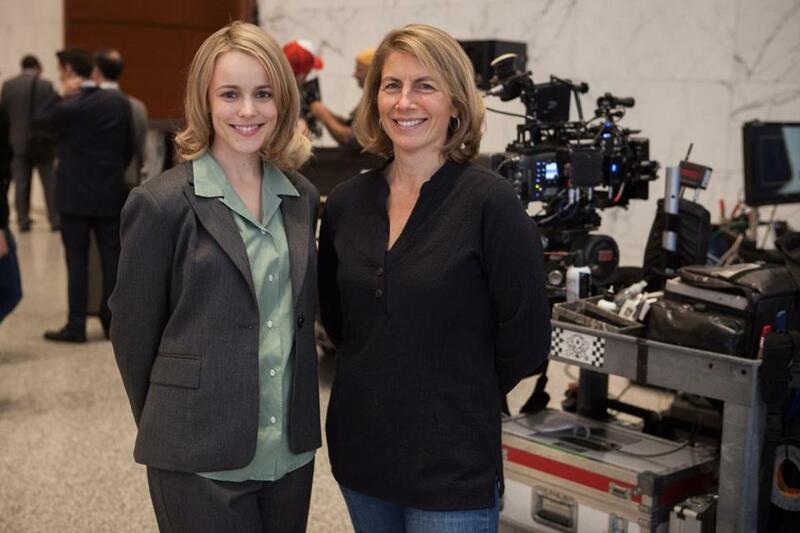 Rachel McAdams (left) and Sacha Pfeiffer. Rachel McAdams rose to fame after her role in 2004’s “Mean Girls” and “The Notebook.” “Spotlight” isn’t her only newspaper-based drama; in 2009, she starred alongside Russell Crowe and Ben Affleck in “State of Play.” Other movies include: “Sherlock Holmes” (2009) and Woody Allen’s “Midnight in Paris” (2011). Sacha Pfeiffer was a member of the Boston Globe Spotlight Team for five years. She is a reporter covering wealth, nonprofits, and philanthropy. She has also been a senior reporter and host of “All Things Considered” and “Radio Boston” at WBUR, Boston’s NPR station, and a host of NPR’s nationally syndicated “Here & Now” and “On Point.” At WBUR, she won a national Edward R. Murrow Award for broadcast reporting. Pfeiffer was a John S. Knight journalism fellow at Stanford University. Mark Ruffalo (left) and Michael Rezendes. 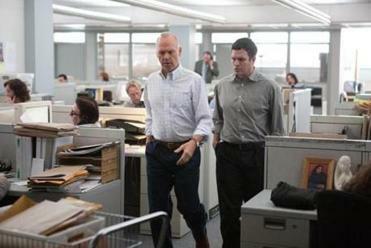 A look at The Boston Globe’s coverage of sexual abuse in the Catholic Church and the movie “Spotlight,” which is based on the stories and the reporters behind the investigation. Mark Ruffalo played the Hulk in Joss Whedon’s “The Avengers” (2012); a sperm-donor father in “The Kids Are All Right” (2010); and took the lead as Larry Kramer in “The Normal Heart” (2014). He also directed and costarred in “Sympathy for Delicious” (2010), which won the Special Jury Prize at the Sundance Film Festival. Michael Rezendes is an investigative reporter and the senior member of the Globe Spotlight Team, on which he has served for over a decade. Most recently, he exposed the sometimes fatal conditions at a state prison for mental health patients, leading to reforms and criminal indictments. In 2008 and 2009, he was the recipient of a John S. Knight journalism fellowship at Stanford University. 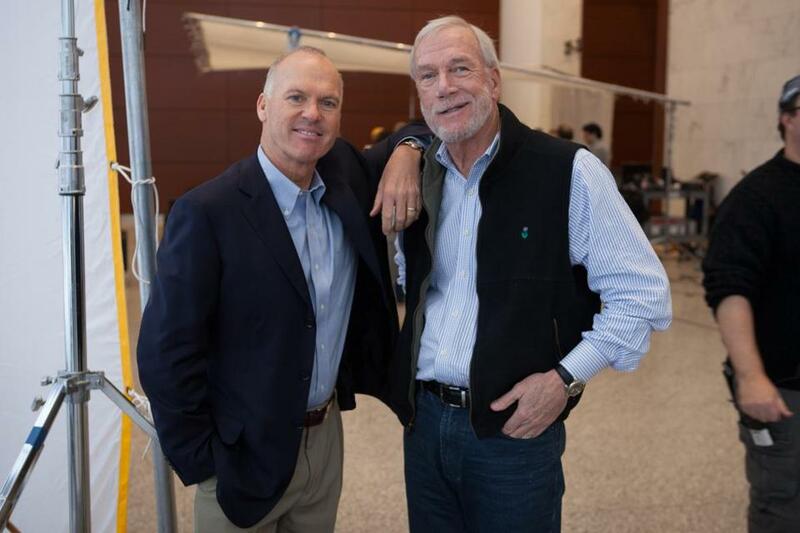 Michael Keaton (left) and Walter V. Robinson. Michael Keaton won a Golden Globe for his performance in “Birdman” in 2014. Keaton is known for his work in 1982’s “Night Shift,” and went on to appear in many memorable comedies, including “Johnny Dangerously” (1984) and “Beetlejuice” (1988). He played Batman in Tim Burton’s ”Batman” (1989) and the sequel “Batman Returns” (1992). He appeared in movies such as “The Paper” (1994), a film by Ron Howard, in which Keaton played the metro editor of a New York City tabloid. Walter V. Robinson, who is the Globe’s Editor At Large, has been at the Globe as reporter and editor since 1972. As a reporter, he covered four presidential campaigns, two presidents and was the paper’s Middle East bureau chief during the first Persian Gulf War. He has reported from 33 countries and 48 states. He was also city editor, metro editor, assistant managing editor for investigations, and editor of the Spotlight Team for seven years. From 2007 to 2014, he was Distinguished Professor of Journalism at Northeastern University. 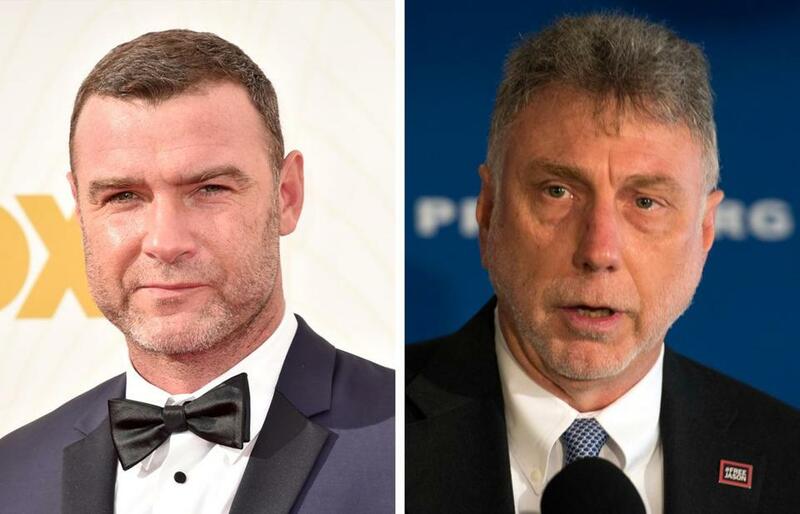 Liev Schreiber (left), Martin Baron. Martin Baron was the editor of The Boston Globe from 2001 to 2012. He is now the editor of The Washington Post. Prior to working at the Globe, he served as executive editor of The Miami Herald. 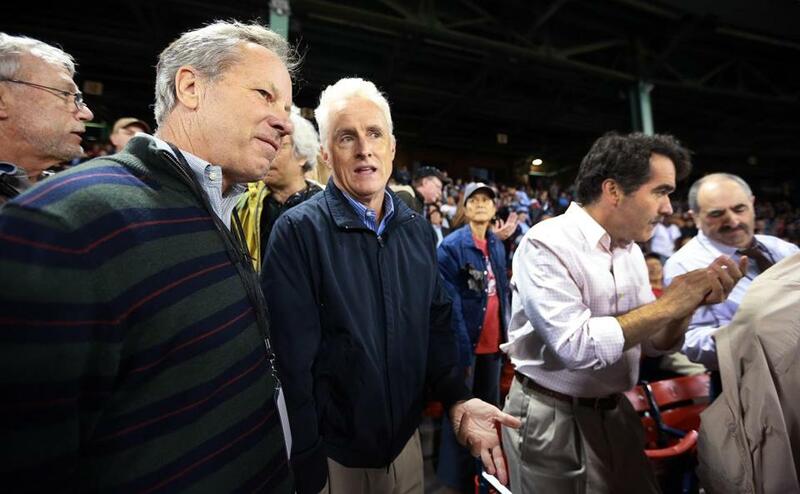 John Slattery is Ben Bradlee Jr.
Ben Bradlee Jr (left) talked with John Slattery when “Spotlight” was filming at Fenway Park in 2014. Boston native John Slattery began his acting career in 1988, but he made his name as Roger Sterling in AMC’s “Mad Men” (2007-15). He’s appeared in “Desperate Housewives” and “Will & Grace.” He produced and directed the movie “Gods Pocket” (2014), which starred Christina Hendricks and Philip Seymour Hoffman. Ben Bradlee Jr. worked at the Globe for 25 years. He was on the Spotlight Team, and as an editor, he supervised the paper’s State House and City Hall bureaus, oversaw local news, and later was named deputy managing editor. He was the Globe’s national correspondent from 1982 to 1986. He has written several books. Matt Carroll was a reporter with the Globe from 1987 to 2014. He was the database reporting specialist for the Spotlight Team. He was also part of the team that won the 2012 George Polk Award for Legal Reporting for its series on acquittal rates by judges in drunk driving cases. In 1994, Carroll started the Globe’s first internal website. 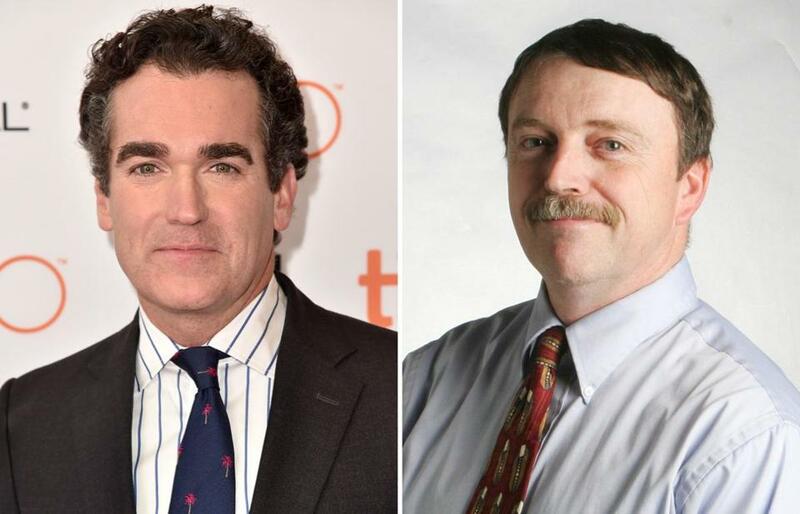 Before joining the Spotlight Team in 1997, he covered business and suburban news. He is currently a research scientist at MIT’s Media Lab in the university’s Center for Civic Media. Gene Amoroso was in “Mystic Pizza” (1988), “The Invention of Lying” (2009), and “The Company Men” (2010). Steve Kurkjian was a Globe reporter and editor for 40 years, including 17 years on the Spotlight Team and five years as Washington bureau chief. He rejoined the team shortly after the sexual abuse scandal broke in January, 2002, and played a major role in chronicling the extent of the Church’s cover-up, reporting for which he shared the Pulitzer Prize in 2003. It was his third Pulitzer Prize. Maureen Keiller appeared in “Fever Pitch” (2005), “My Best Friend’s Girl” (2008), and “The Makeover” (2013). Eileen McNamara was a Globe columnist, and worked at the Globe for almost 30 years. She won a Pulitzer Prize for Commentary in 1997. She is now a professor at Brandeis University. Doug Murray was in “How to Lose a Guy in 10 Days” (2003), “Family Biz” (2009), and “Man of the Year” (2006). Peter Canellos was the editor of the Globe’s editorial page since from 2009 to 2014. He at was the Globe for 26 years, including positions as metro editor and chief of the newspaper’s Washington, D.C., bureau. He is now the executive editor at Politico. Michele Proude also appeared in “Gone Baby Gone” (2007), “Underdog” (2007), and “Clear History” (2013). Lisa Tuite is the head of the library. She directs a staff of researchers who provide news research and investigative research to reporters and editors. She has worked closely with all the Spotlight teams in her 36 years at the Boston Globe.